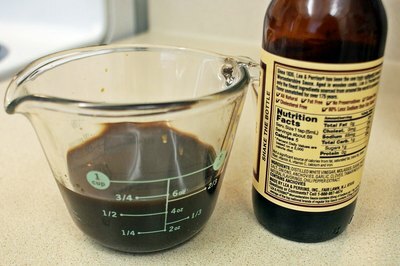 Worcestershire sauce, pronounced "wust-ter-shire, "woos-ter-sheer" or "woos-ter-sher" sauce, according to the original manufacturer Lea & Perrins, has been used as a marinade for steak for more than a century and a half. It contains most of the ingredients for a successful marinade right in the bottleand may be used as is to marinate your steak. It's a blend of vinegar, which acts as an acid to tenderize the meat, sugar (in the form of corn syrup and molasses) and strong flavorings, including roasted onion and garlic purees. The secret ingredient is a paste made from anchovies, which gives it a distinctive taste. Prepare the marinade. 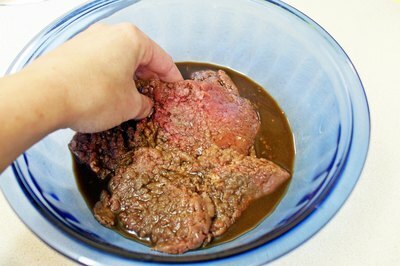 Put 3/4 cup of Worcestershire sauce in a bowl or enough to cover the number of steaks you intend to cook. 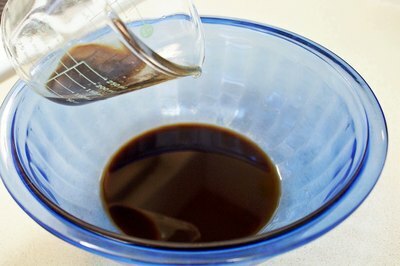 According to the BBC series on cooking, you'll need to use a glass or ceramic bowl, as the vinegar in the Worcestershire sauce can react with metal bowls. You can also use a food storage bag with a strong seal. Prepare the steak. Trim visible fat and prick the surface on both sides with a fork so the marinade can penetrate. Submerge the steak in the marinade so all surfaces are covered. 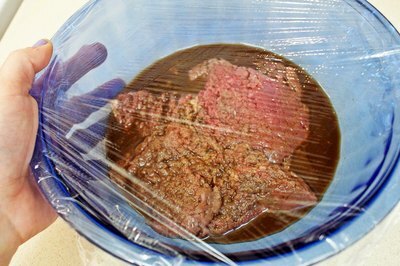 If you choose to use the plastic bag, put the steak inside the bag and pour in the marinade to cover. Place the bag flat on a plate. Place the steak in the refrigerator. Marinate 4-6 hours. Turn the steak over a few times if it is marinating in a bowl. If you have used a plastic bag, turn the bag over several times during the marinating process. 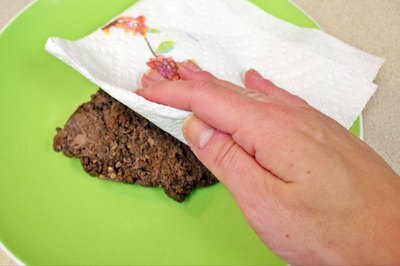 Remove the steak from the marinade and pat it dry on both sides with paper towels so it will brown nicely. It is now ready to cook on the grill, in the oven or in the skillet. What Is the Difference Between Tamarind Puree & Tamarind Paste?